It's another new week. Today I don't have nail polish on my fingernails because I just chopped all my nails off. Lately there are a lot of things that I need to run. Speaking of election, I'm sure you girls already heard of the news that no nail polish during polling day. If you haven't do read the news on The Star below. Actually you are allowed to wear nail polish. Just that the indelible ink will inevitably stain your manicure. 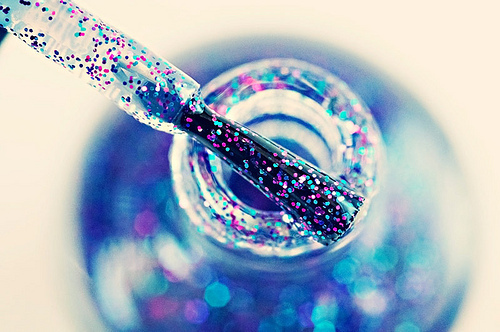 Instead of getting your nicely painted nails ruined by the ink, it is better not to wear manicure. PETALING JAYA: Sacrifice getting that manicure before going to the ballot box. The Election Commission (EC) has told voters not to get their nails done before polling day, as their fingernail will be stained with the indelible ink. “It is simply unavoidable. So, I would advise against getting that RM200 manicure this election period, as you won't be able to rub the ink off your nail polish,” said EC deputy chairman Datuk Wan Ahmad Wan Omar. He added that the indelible ink would be in two colours, which would be kept a secret until polling day. Wan Ahmad said that getting their finger stained with the ink was a must for every voter, to ensure no double-voting during GE13. He said the ink could not be rubbed off using any substance, including nail polish remover, and that it would remain on a finger for up to five days. The ink used for advance voting, he said, would only fade off after about 10 days. According to the EC guidebook on the voting process, the ink would be applied starting from the first joint of the left index finger, up to the tip of the fingernail. The guidebook said individuals like amputees, who were unable to have their left index finger marked with the ink, would be marked on other fingers or other visible parts of their arms. Wan Ahmad added that the ink had been tested and approved by the Health Ministry as safe to use, and should not cause any allergic reactions. Having caught the election fever and being excited about her first voting experience, Lim Sue Yin had her nails painted with different political party flags, and left her left index finger “naked” in preparation of it being marked with the indelible ink. She even had a “trial run” with a marked finger, using black nail polish. The 26-year-old writer, who goes for a manicure once a month, said it was to show her support for the coming GE13 and also for the country. “I don't mind walking around for a few days with a finger painted with the ink. I would be proud to show that I have exercised my right to vote,” she said. Another first-time voter May Salitah Naru Kiob, 25, said she does not mind getting ink over her manicured nails, as long as they “paint nicely”. “I support the usage of the indelible ink as it shows that the EC is taking constructive measures to ensure a clean elections,” said the marketing executive, who goes for a manicure twice a month. Are you going to vote this GE? I personally can't wait for 5th of May. This will be my first time voting. I've missed my chance in 2004 because I was young and ignorant (those days they don't permit students to get involve in politics, so I was really ignorant) and then I wasn't living in the country in 2008 and totally missed that important GE. 2008 was the turning point of Malaysia's political history. After 2008, Malaysians are more aware of their rights and more involved in the governance of the country. When it comes to politics, I can go on and on. As a reminder, you should because it is your constitutional right and it is our country's democracy practice. Not every country can enjoy such privilege. If you know me in real life (or following me on Twitter) already know which party I'm voting for. It is quite obvious. Let's not condemn each other's personal preference. Every party has its own strengths and flaws. I respect everyone's right and opinion over which party they support. So, vote wisely. Another great article chic. I love your style and the products you use.